In a recent piece I gamed out predictions for the second summit of the US and North Korean leaders while preparing to analyze the final statement that came out of the summit, as I did with the previous documents of this kind. Regrettably, this time I will have to figure out where my prediction went wrong instead. Recall the history of the previous summit in Singapore that Trump cancelled and then uncancelled. This time around everything seemed different. Experts, including myself, decided to relax in the hope that there would be no force majeure this time, and yet this is exactly what happened. The breakdown occurred at the last moment. Both leaders had made promising statements early in the summit’s second day. They said they even discussed the possibility of opening liaison offices. When asked if he was prepared to denuclearize, Kim Jong-un said he wouldn’t be there if he was not. Kim and Trump talked one-on-one for 20 minutes and then took a stroll together outside for 10 minutes. It was only at the following round of talks that something happened that ended the summit early. The sides cancelled a joint lunch and left ahead of schedule, not to mention the fact that the Hanoi Declaration, said to have been drafted already, remained unsigned. There are conflicting versions of why Trump and Kim left so suddenly. The first version comes from what Trump said – the sides could not come to terms. However, North Korea's version is somewhat different. To believe Trump, Kim was ready to dismantle the nuclear reactor in Yongbyon (which is the key element of North Korea’s nuclear program) but a) the Americans knew more and wanted more, and b) in response the DPRK demanded that sanctions be completely lifted, which the US was not ready to accept, meaning there was nothing left to discuss. North Korean Foreign Minister Ri Yong-ho said at an impromptu briefing that the DPRK suggested only partial, not complete, lifting of sanctions, contrary to what Trump said. In exchange, the North Koreans promised to guarantee in writing that they will keep the moratorium on missile and nuclear tests and finally stop processing uranium and plutonium (read: they promised to shut down the nuclear center in Yongbyon under the supervision of US experts). At first, only the lifting of sanctions affecting the civilian sector of the North Korean economy was discussed, but the US suddenly demanded additional steps that became a stumbling block. This version is indirectly backed up by a lapse of Secretary of State Mike Pompeo who said that the North basically asked for full sanctions relief. Indeed, most sanctions do not concern defense-related goods. At best, they cover dual-purpose products. As for textiles, coal and labor, they formally comprise the civilian sector. But considering that the US president said “I think they were surprised that we knew” about certain facilities, the US could demand as a condition dismantling and/or inspections beyond the universally known facilities. At this point it should be noted that Kim, in his New Year address, mentioned, among other things, the construction of new nuclear plants. North Koreans told me in 2016 that they were building nuclear power plants. If Trump heard such statements, he could well inquire what these are and whether they can produce weapons-grade uranium or plutonium. If so, then making a show of destroying an old nuclear reactor is just a gesture for the public. After all, there is a new one! The second version was suggested by former Minister of Unification Jeong Se-hyun. He said that everything was ruined by US National Security Advisor John Bolton who suddenly demanded that the DPRK fully disclose all information not only on its nuclear program but also its work on other weapons of mass destruction (biological and chemical). US hawks often interpret denuclearization as the complete renunciation of all weapons of mass destruction by North Korea. Bolton’s hawkish position is well known, so this version should be taken into account despite its conspiratorial hue. According to the third version, the summit was ruined by domestic politics in the US. On February 27, Michael Cohen unleashed a torrent of unflattering details about Trump in his public testimony before Congress, which influenced the course of the talks. Possibly Kim asked Trump: “We trust each other personally but where is the guarantee that your successor will not disavow our agreements?” Maybe Trump decided that against this backdrop any earlier agreements where the goal was to meet each other halfway will look like a criminal concession. Americans have already heard that Trump is “a racist, a con man and a cheat,” and now they will see the North Koreans walk all over him! Better not to sign anything and return to this issue when passions in the US abate. Watching the US president’s press conference, I wondered whether it was addressed to the international public or Trump’s base. If it was the latter, many things fall into place. Trump was essentially saying: “We did not back down! We did not make concessions to North Korea and did not sign an agreement just for the sake of an agreement. But we will continue the dialogue.” This is a good explanation for the American audience and allows him to look, if not like a winner, then at least not like a loser. This is backed up by the reactions of members of Congress. Both Democrats and Republicans praised the president for not signing anything this time. As for whether the summit was a failure, while it may have fizzled, both parties might just consider it a success. Trump showed himself as an uncompromising politician while Kim received yet another summit with the US president, which has improved the image of the leader of this former “rogue state.” Both sides reaffirmed their intention to continue the dialogue and their desire to reduce regional tensions. What next? We will judge based on the frequency and results of negotiations at the working group level. If the process does not break down, it will show that the commitment to dialogue is real, and when passions in US politics subside, the countries will probably have another chance at a productive meeting and will make the kinds of reciprocal concessions I wrote about earlier. Kim-Trump Summit: Why Did Personal Diplomacy Fail in Hanoi and What Comes Next? 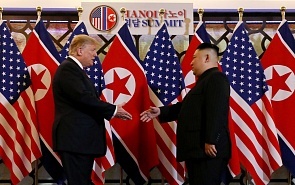 ﻿It appears that Kim Jong Un and Donald Trump will continue to negotiate despite the Hanoi setback. In the best case scenario, this may lead to a compromise that, while not securing the nuclear disarmament of North Korea, will nevertheless reduce geopolitical risks linked with the country's nuclear program.